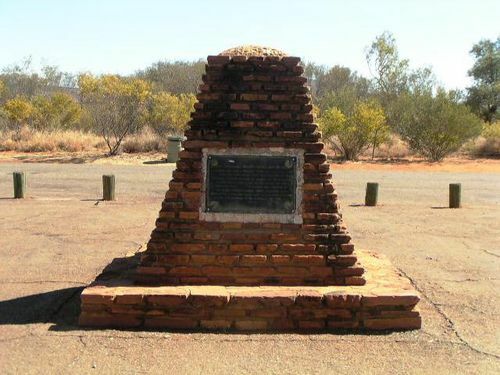 A cairn commemorates the centenary of the discovery in 1860 of the centre of Australia by explorer John McDouall Stuart. Explorer John McDouall Stuart successfully crossed Australia opening the way for the construction of the Overland Telegraph Line. 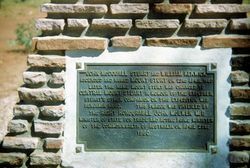 On April 23, 1860 Stuart located the geographical centre of Australia, near a mountain he named Central Mount Sturt after Charles Sturt, who he had joined on his failed expedition of 1844 to find the centre. Later it became known as Central Mount Stuart. Minister for Territories, Mr. Paul Hasluck, M.P., said that it is intended that Central Mount Stuart which is very close to the exact centre of the continent will be developed as a tourist site. The explorer John McDouall Stuart reached the centre of Australia on April 22, 1860, and climbed the nearby mountain on the following day. He called it Mount Sturt in honour of Captain Charles Sturt but it soon after became known as Central Mount Stuart "Central Mount Stuart will be the focal point in the opening ceremonies of next year's Centenary of Exploration in the Northern Territory." Mr. Hasluck said. "A cairn will be built on the mountain and the Northern Territory Administration intends to develop the site as a tourist lookout. "Central Mount Stuart is quite close to the main north-south road and dominates the surrounding countryside. The view from the top of the peak is magnificent." The Beverley Times (WA), 4 February 1960. JOHN MCDOUALL STUART and WILLIAM KEKWICK Ascended And Named MOUNT STURT On The 23rd April 1860. Later The Name Was Changed To CENTRAL MOUNT STUART In Honour Of The Explorer. Stuart's Other Companion On This Expedition Was Benjamin Head.